The Massachusetts Institute of Technology (MIT) is a major research university in the United States, located in Cambridge, Massachusetts (about three miles east of Harvard University). In 1949 its president James R. Killian described it as "a university polarized around science, engineering, and the arts." MIT pioneered the use of hands-on laboratory instruction and made important contributions to the World War II development of radar. In the 1950s, the Project Whirlwind computer at MIT developed the use of magnetic core memory, the first practical form of RAM, and the use of computers for simulation and real-time control. MIT was a pioneer in university-industry liaisons, particularly the startups that grew up around Route 128 starting in the 1950s, and helped make the Boston area a leader in high-tech industry. 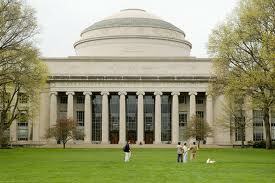 MIT was founded in 1861, and was among the first universities to receive land-grant money under the Morrill Act. It was originally located in Boston, moving to its present location in Cambridge in 1916. The 1916 "Maclaurin buildings" form a symmetrical complex in classical-Roman-like monumental style. The complex frames three sides of the large grassy sward now called Killian Court, facing the Charles River (but separated from it by a multi-lane parkway). The names of some hundred or so famous scientists (Aristotle, Lavoisier, Faraday, etc.) are engraved on the "attics of the pavilions" of the buildings. MIT's business school—the Sloan School of Management—is very highly ranked and offers undergraduate and graduate programs. MIT has no law or medical school, though its biology department is renowned. Among MIT's most well-known professors are Ronald Rivest (of "RSA" fame), Tim Berners-Lee (of World Wide Web fame), Marvin Minsky (a pioneer in Artificial Intelligence) Noam Chomsky (a pioneer in linguistics, and later an anti-war activist), Frank Wilczek (Nobel prize involving the "standard model" of particle physics), and Richard Lindzen (meteorology). It consistently ranks as the top university in the world for science and engineering, as well as the top university overall. Comparable universities with a technological focus include California Institute of Technology ("CalTech"), Rensselaer Polytechnic Institution (RPI, in New York), Georgia Institute of Technology (Georgia Tech), and Purdue University (in Indiana). ↑ QS World University Rankings (English). The Guardian.